Description: Built on the rolling hills and wooded expanses of Monmouth County, Mark Mungeum has designed a nice mix of golf holes here to create a atmosphere that feels exclusive and provides and excellent and enjoyable test of golf. 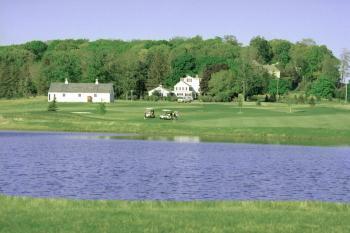 The most prominent feature throught the course would be the large, undulating, bentgrass greens. Because the course is kept in such good shape, they are normally very fast and can create havoc if you find yourself in the part of the putting surface. They are also guarded by some bunkers that, although not too deep or punishing, create a need for strategy and course management. Adding to the ambience is also the abundance of small ponds and fescue grasses. Although normally off the beaten path, the grasses frame fairways and greens to make for an aesthetically pleasing round, where the water comes into play on a couple holes yet isn't too intrustive. The front nine is definitely more open, built on the gently rolling terrain with few trees, with the back nine tightening as it is routed through the more wooded areas of the property. Overall, it's a great mix of golf holes for all levels. Reader Comments: Deceptively challenging despite its length ... Interesting par-3’s, ultra-fast greens ... Bring your A-game if you plan on scoring here ... The terrific staff here makes you feel at home. Description: The Blue has evolved over the years, getting rerouted and trading some holes with the Yellow course. The result is an outstanding mix of design features, with some rolling elevation on long par-4s and par-5s and exceptional mid-range par-3s. In general, the greens are pretty small and well-guarded and the course is kept in great condition while being playable for all levels of golfers. The front nine of the Blue is without question one of the toughest and most enjoyable nine holes in the area. Some holes - most notably the 465-yard, par-4 sixth, with its sloping fairway away from the dogleg left - are as tough as almost anything on the Black. The back nine eases up a little bit, but does not pull back from the need for precision and accuracy that is consistent throughout this fully enjoyable golfing experience. Reader Comments: The front nine is my favorite nine holes, private or public, in the area ... All four Par 3's will challenge even the best golfer...A real great mix of doglegs, with some nice hills and deceptive approach shots ... Great golf for every skill level ... A real classic that has stood the test of time ... I could play it every day ... I’d say the sixth hole is as tough as anything on the Black, except perhaps No. 15.